Join us to get great money-saving tips, cool ideas, and valuable advice from home improvement expert Don Vandervort! How often? Only every month or two. Unsubscribe anytime! You have successfully subscribed! Thanks from the HomeTips Team. As water becomes an increasingly scarce and expensive resource, drip and micro irrigation systems are gaining in popularity as alternatives to conventional sprinklers for watering yards and gardens. Unlike sprinklers, which cast water across a broad area, drip systems slowly and precisely deliver water to the base and roots of plants. This targeted approach eliminates water loss caused by wind, overspray, evaporation, and runoff and encourages deep percolation at plant roots. Because of the reduction in runoff, drip systems are particularly effective for watering plants on hillsides and sloping ground where runoff can be a big problem with more-conventional means. 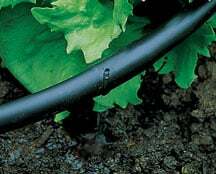 Because a drip irrigation system offers slow and even water delivery, it is a smart choice for shrubs, vegetable patches, and flowerbeds—especially in sandy soils and arid climates. Drip systems equipped with mini-sprayers or micro-spray heads can be an efficient way to irrigate trees, large shrubs, and narrow or irregularly shaped lawns. In addition to saving water, delivering water by a drip system reduces weeds and fungal diseases that can be spread by water on foliage and tree trunks. Installing a drip system doesn’t require special tools or digging deep trenches, so it can be done easily even in existing gardens. Be aware, however, that drip tubing snakes along the top of the ground (or just below the surface), so it is often visible. Because many of the components are exposed, they’re subject to damage from animals, children, lawn mowers, and garden tools. And because drip systems utilize very low water pressure for water delivery, they can clog easily, so you may need to check and clear them occasionally. This all means you may not be able to go away for repeated extended vacations with the confidence that your plants will be alive when you return. That said, as water shortages become more common, drip systems offer a great way to conserve water while still maintaining a beautiful landscape. 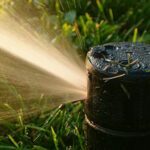 More and more yards are using a combination of sprinkler and drip systems to water the lawn and surrounding landscape. If you decide to go this route, make sure you use enough control valves for all the sprinkler and drip circuits. 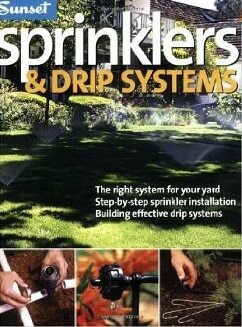 Install the sprinklers first, and use the same timer to control both. A drip irrigation system uses flexible polyethylene tubing to direct flow to emitters or small sprayers that gradually water a plant’s roots. Polyethylene tubing is used because it is resistant to UV damage and because fittings are easily attached to it. In addition to tubing, each circuit needs fittings, watering devices, a head assembly, a filter to prevent the small sprayers from clogging, a fertilizer injector if desired, and a pressure regulator if needed. Most drip systems work best with very low water pressure (15 to 30 pounds per square inch); a pressure regulator will reduce the water’s pressure if it is too high. A single circuit can be run from a head assembly connected to an outdoor faucet, or multiple circuits can be attached to separate control valves to customize watering for different areas. Drip systems can also be attached to timers, which can control multiple circuits. Drip-system kits are a great way to get started as they come with all the parts and tools you’ll need for basic irrigation. Once you have the main line assembled, you can add more tubing and emitters as your watering needs change. Drip hose is commonly used to carry water from the control valve to the areas being watered. PVC sprinkler pipe is used to deliver water from the supply to the control valve since drip tubing won’t hold up under the pressure of constant water delivery. Drip tubing is made from black polyethylene, which stands up to the sun’s UV rays and therefore can last from 15 to 25 years. Extremely flexible, it winds easily around shrubs and trees, vegetable gardens and flowerbeds. It is usually found in 1/2- or 3/8-inch diameters, so be sure to check the manufacturer’s specifications for both inside and outside dimensions as one brand of tubing may not work with a different brand of fitting. 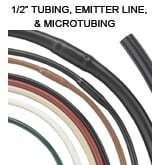 Half-inch tubing is usually used as the main drip line and can handle flow up to 320 gallons per hour (gph). Narrower 3/8-inch tubing can be used where the system branches off to individual areas; it can deliver up to 100 gph. The even narrower 1/4-inch micro-tubing is sometimes used to connect emitters. Although 1/8-inch tubing is available, it clogs easily. Micro-tubing can carry about 15 gph and is made of polyethylene or vinyl. Emitters can either be installed into the tubing, or you can purchase the popular emitter line—tubing with built-in emitters. Lay drip tubing directly on the ground, but don’t bury it beneath the soil where it will be vulnerable to gophers and moles. You can cover it with mulch if you like, but its dark color usually keeps it fairly unnoticeable. It’s important to use the right size drip fitting for your tubing so the assembly won’t burst apart when the water is on. Different sizes come in different colors—red for 3/8 inch and blue or green for 1/2 inch. Be aware that these two 1/2-inch fittings are not actually the same size, nor are they interchangeable, so choose one or the other based on the needs of your system. Couplings extend a drip system by joining pieces of tubing, or they can be used to reattach damaged pipes. 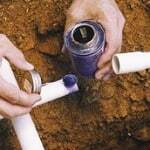 Elbows make neat turns around flowerbeds or walkways, and adapters attach drip tubing to PVC pipe. Barbed, locking, and compression fittings simply snap into drip hose. All three come in sizes for 1/2- and 3/8-inch tubing; 1/4-inch tubing takes barbed fittings. Locking fittings require no force at all to attach. 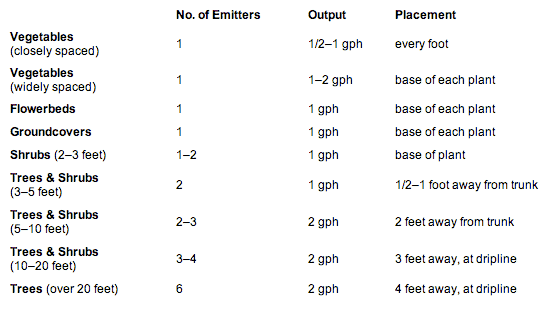 The chart below outlines the number and capacity of emitters (in gallons per hour) required for various types of plantings throughout a yard and garden. Ranges are provided in certain cases because no two soils are alike. In those cases, choose the higher number for light soil that drains rapidly and the lower number for dense soil that retains moisture. Emitters drip water directly onto the soil at the plant’s root zone. Most emitters have barbed ends that snap into 1/2-inch or 3/8-inch polyethylene tubing, or can be pushed into the ends of microtubing. In-line emitters can be inserted between lengths of 1/4-inch tubing alone or in a chain. There are many different emitters on the market, varying in output rate as well as in shape, size, and internal mechanism. Most types dispense 1/2, 1, or 2 gallons per hour (gph). Emitters are color-coded by water output; the tubing delivering the water always goes into the colored side. Unlike sprinkler heads, emitters with different output rates can be used in a single circuit to accommodate different plants’ watering needs. By choosing emitters with slower drip rates, you can place more in a single zone or run a longer line of tubing. For a large or sloped garden, consider investing in pressure-compensating emitters. These emitters deliver a precise amount of water regardless of changes in pressure along a line, and they rarely clog because a flexible diaphragm inside regulates the water flow and flushes particles from the system. If you have a dirty water supply or very hard water, use either pressure-compensating emitters or nonplugging turbulent-flow emitters, a lower-priced alternative. Some emitters can be adjusted to increase their flow from delivering droplets to a gentle stream of water, a feature that is especially useful for plants growing in sandy soil or porous container mixes. There are also emitters that sit almost flush with 1/2-inch tubing, limiting the chance of damage. Others come with a built-in stake to hold them just above the soil. You can also buy multioutlet emitters to run microtubing to nearby plants. Emitter line is tubing with emitters preinstalled at regular intervals inside the tube. It comes in two sizes: 1/2-inch drip tubing and 1/4-inch microtubing. Sturdy and long-lasting, emitter line is less expensive than tubing and emitters purchased separately, and it provides a slow, even output of water. 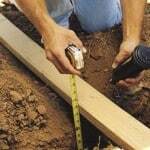 The 1/2-inch size is a practical choice for watering hedges, vegetable beds, and densely planted flower beds; the 1/4-inch size is better for window boxes and large containers. 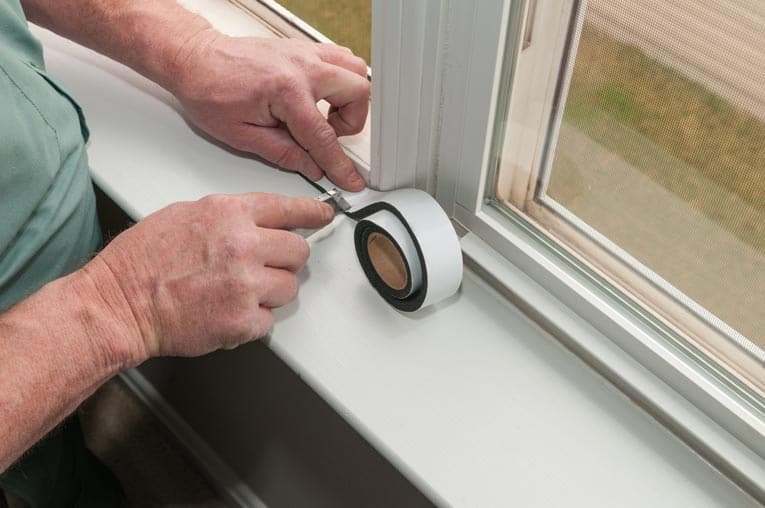 Don Vandervort has developed his expertise for more than 30 years, as Building Editor for Sunset Books, Senior Editor at Home Magazine, author of more than 30 home improvement books, and writer of countless magazine articles. He appeared for 3 seasons on HGTV’s “The Fix,” and served as MSN’s home expert for several years. Don founded HomeTips in 1996. 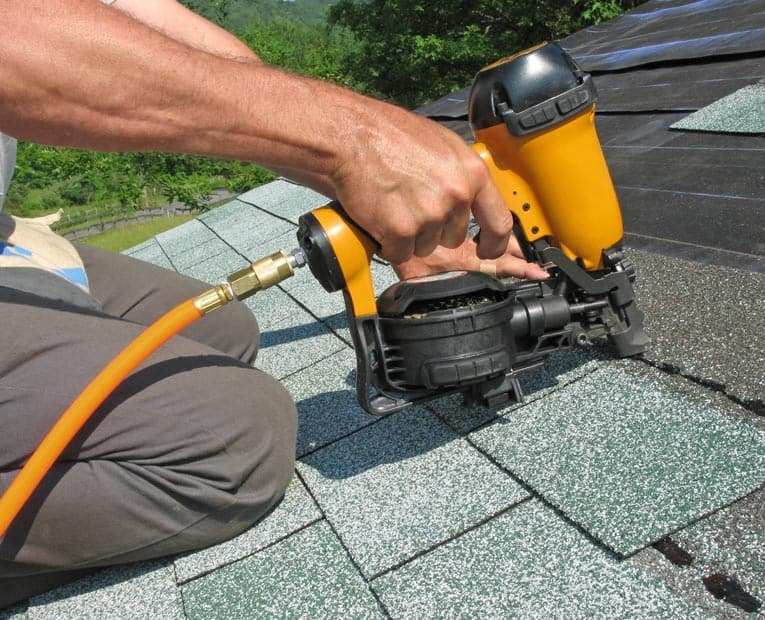 Installing a New Roof? Make It Last Longer! HomeTips.com is a participant in the Amazon Services LLC Associates Program, an affiliate advertising program designed to provide a means for sites to earn advertising fees by advertising and linking to Amazon.com.